Gloria Jean Larsen, 83 of Centuria passed away in the early morning on Monday, March 19, 2018 at Regions Hospital in St. Paul with loving family at her side. Gloria Schwartz was born on September 9, 1934 the daughter of Marie and John Schwartz. Gloria attended grade school at the South Milltown School before going to Milltown and graduating in 1952. She worked at Stokley’s canning company, painted in the Cities during the summer, and worked at the ammunition plant in Arden Hills. She fell in love with the farm boy next door, literally across the field, and married Gordon Larsen in 1954. Together they built Wis-Lar Farms with their children - Jim, Jeanne, and Jerry. Their work proved successful being named the first dairy herd in the state of Wisconsin to yield a 20,000 pound rolling herd average. Early on in their marriage, Gloria became a member of the 35 Birthday Club. 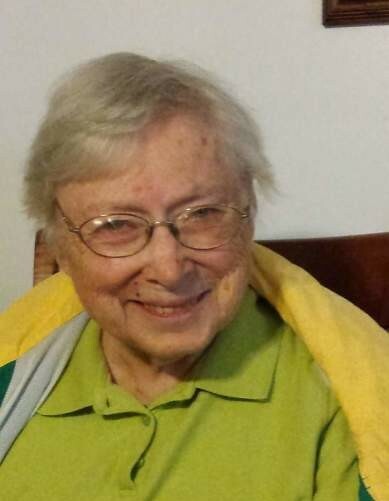 Besides being actively involved on the family dairy farm Gloria became active in the Polk County Homemakers organization, where she was Historian for many years at the county level. During that time she compiled the “I Heard The School Bells Ringing” historical book about the one and two room school houses in Polk County. She was a county representative to the state Homemakers for several years. Working with youth was important to Gloria to give them the opportunity to try new things, she was a 4-H leader and project leader for the South Milltown 4-H for over 20 years. “She could always make me smile, share her talent secrets, and had the patience of a saint.” said granddaughter Jena Alling. Agriculture was in her blood, continuing on with advocating agriculture and education through the Unity Area FFA Alumni events in the community. Expanding on her service to the community she joined the Unity Lions Club. Her creativity and artistry could be seen every year at the Polk County Fair with her watercolor and acrylic paintings with grand champion ribbons. Plus her sewing skills making clothes for the kids, grandkids and quilt tops for the women at Milltown Lutheran Church. “She taught me many things, from being a hard worker, to making amazing pies,” said granddaughter Jenelle Larsen. Gloria loved her gardens, whether it was her flowers or berries. She would pick berries and make amazing raspberry jam that was a hit at the local farmer’s market. She would teach her grandkids how to make homemade bread rolls, how to make swedish palt, and shared her artistic talents making crafts with the kids all the time. Hours of time would have been spent baking for bake sales, pot lucks, or making treats for people who came to visit. Often times salesmen would stop by and be invited in for lunch. “She could cook for an army in the matter of an hour,” said grand daughter Jennifer Larsen. Modest achievements for Gloria included being on the Polk County Homemakers Board for years having served as President and Historian, Polk County 4-H Leader Award for 20+ years, Honorary Wisconsin State FFA Degree, 15 year tenure in the Unity Lions Club, and an active quilt maker for the Milltown Lutheran Church. Gloria leaves to celebrate her memory: daughter, Jeanne (Al) Alling, Centuria, WI; son, Jerry (Stephanie) Larsen, Centuria, WI; daughter-in-law, Evelyn Larsen, Centuria, WI, grandchildren: Jennifer Larsen, Julia (Jacob) Erickson, Johanna (Brian) Backes, Jenelle Larsen, Joshua Larsen, Jonathan Larsen, Joe Larsen, Jena Alling and Anna Larsen, great grandchildren, Jade and Jasper siblings: Ramona Anderson, Lois Berglund, Geraldine (Don) Seaberg, Marjorie Boertjen, John (Olga) Schwartz and Galen (Alice) Schwartz, nieces, nephews and other loving family and friends. She was preceded in death by her parents, John & Marie Schwartz, her husband, Gordon Larsen, son, Jim Larsen and grandson, James Larsen. The funeral service for Gloria will be held on Friday, March 23, 2018 at 11:00 A.M. at the Milltown Lutheran Church. Pastor Angie Kutney will officiate. Visitation will be held on Thursday, March 22, 2018 at the Kolstad Family Funeral Home in Centuria from 4:00 P.M. – 7:00 P.M. and again at the church Friday from 10:00 A.M. – 11:00 A.M.
Gloria will be laid to rest alongside her husband Gordon at the Milltown Cemetery following the funeral service. The family invites guests to join them in the church fellowship hall for lunch following the cemetery service. Casketbearers will be Joe Larsen, Joshua Larsen, Jonathan Larsen, Anna Larsen, Brian Backes and Jacob Erickson. The Kolstad Family Funeral Home in Centuria has been entrusted with funeral arrangements.